Something went awry with the steering! First, let me explain what a tie-rod-end is: on wheeled vehicles, the tie-rod is a part of the steering assembly that fits onto the wheel with by a stout pin on the end that is secured with a special nut that cannot come undone because a split-pin holds it in place. Without the whole tie-rod in place, the vehicle can’t be steered. My truck had been into Arusha for a service, and the next day, Tuesday, I headed out the gate, made a sharp right turn, and then a left and as I passed the secondary school, there was a shallow drainage ditch I had to jump over. I lost steerage on the other side! Sure enough the tie-rod-end had popped out from where it should be fixed to the wheel. I tied it in place with some wire, drove back to the house and called the Agency field rep to send out the fundi, mechanic. 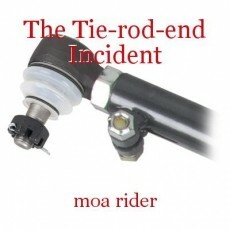 How could the tie-rod-end pop out of place when there is careful design for it not to? Well, dear reader, you be the judge. The previous Sunday, I had a call from Loti to say there was a funeral in the village we intended to visit the next day, so it was no use going out there. We had been busy and I didn’t have time to have the Toyota serviced, so Monday was my chance. I drove into Arusha to Scarlet, the field rep’s house to ask her to arrange for the fundi. We knew she had taken up with a local guy who owned a safari company and he made something on the side by arranging for the fundi. It wasn’t an honest way of going about things, in fact we volunteers were a bit outraged, but that’s way she was managing things. She had a high steel gate, which was chained closed, I peeped through the chain hole and although I could see her vehicle there, I figured she wasn’t home. Repeatedly I banged on the gate, hoping her mlinzi, security man, might come but there was no response. Not wanting to waste a twenty five kilometre trip into town, I climbed the gate thinking to leave a note on the door. I was surprised and a bit concerned to find the door wide open. Well there was a dog fight on the couch! The grunting and groaning was the reason my banging wasn’t heard. I saw parts of Scarlet and her safari driver friend that are better covered with a tarpaulin! The safari driver was embarrassed and Scarlet was frothing mad! I admired the scenery outside while to two scurried to dress. I was in no hurry, but I had a message to deliver and did so amid a few angry words. The safari driver had put his shoes on the wrong feet, which elevated my humour, but did nothing to quell Scarlet’s. The next day, Monday I had the Toyota at the office bright and early, expecting another dressing down, but instead received a letter that eventually went to all volunteers about not entering her house if the gates are closed! The safari driver sheepishly took the vehicle to some backyard boys that I wouldn’t take my wheelbarrow to! Always when I got the vehicle back, there was diesel siphoned out of it! I concede I shouldn’t have jumped the gate, and have no opinion about what she was doing, but I wasn’t going to shrivel before her, so waited in her office for the return of my vehicle. She asked the safari driver the cost of the job and paid him double, before my very eyes! And believe me, I know how difficult it is to source funds! Other than the four kilometre clay track to our house, the tarred road is quite fast and there are some speed bumps to slow traffic down. I was lucky the tie-rod-end didn’t pop out while I was travelling at speed! Five years later, I was back visiting Arusha. I had never confronted the pair about my suspicions, preferring to just leaving them to stew. Scarlet was well gone but she had sold my Toyota at a give-away price to the safari driver. I emailed him to ask if I could hire it for the couple of weeks I was to be over there, but it was already committed. Instead he offered me a saloon car to be driven by his son. We agreed on the price. When it came time for me to depart and to pay him, I gave him fifty US dollars short, and told him it was discount for interfering with my steering ‘that time’. He didn’t say a word! Could have been so bad, Moa, but I guess you were lucky. Not a nice thing to do to get revenge for embarrassment but it made for another entertaining read! This page was created in 0.3945 seconds.